The Watson NB-5L Lithium-Ion Battery Pack works with the same cameras as the Canon NB-5L. This replacement battery pack features a capacity of 960mAh, 3.7V of output power and 3.3 watt-hours. Small and lightweight, lithium-ion batteries can be charged or discharged at any time without developing memory effect. Box Dimensions (LxWxH) 5.6 x 3.1 x 0.7"
NB-5L Lithium-Ion Battery Pack (3.7V, 960mAh) is rated 4.4 out of 5 by 36. Rated 3 out of 5 by DaveTune from Smaller than the Canon Battery This battery came in one of the accessory kits with my Canon SX200 IS. It is listed as a replacement for the canon battery but, it is smaller than the original and actually flops around a bit inside! I just put this one in a few hours ago so I haven't walked around with it yet. The camera displays the fully charged battery icon and seems to be working fine. I gave it 3 stars because it seems to be working OK it's just odd that it is not the same physical dimensions as the original. I'm hoping that the size difference will not affect the tiny retainer that holds the battery in place before you shut the door. Rated 5 out of 5 by namigu from The best back up I really take a lot of pictures while I'm travelling so I definitely needed a back up for the battery of my digital camera (Canon PowerShot SX210 IS). As a student/traveler, I didn't have a lot of money, so I decided not to buy the original Canon replacement (just 1000mAh). I found this option that doesn't last as much as the original, but it is enough as a back up and it fits perfectly in my camera. Good material, perfect design... just perfect for an entire evening of pictures... also videos!!! The best part is this battery comes with one year guaranty. Rated 1 out of 5 by Phil from Does not fit, useless I purchased these spare batteries for a Canon SX230. The original battery slides in and out easily, assisted by the spring on the battery compartment. This replacement product requires an energetic push to insert it into the compartment, and once there it takes a tool to get it out, as it is too large for the compartment and is for all practical purposes jammed in there. Pretty damning product defect (I ordered 2, they were identical and equally unfitting for their purpose). I suggest B&H remove this product from their store, it is useless! Rated 3 out of 5 by Brooklyn Preschool Teacher from Brooklyn Preschool Teacher Thus far, it's been my experience that generic batteries don't hold a charge as long as the brand names do. However, that said, I haven't yet used this battery; it is on standby as a spare. I have owned the camera for the past few months and to date, I find that the original Canon battery that came with the camera appears to have enough power to get me through several days of use in my classroom. Still good to have a backup spare, and this battery came as part of a package deal on the camera. Rated 4 out of 5 by NoCoErik from less than OEM Decent backup battery. Less power (time in use) than Canon OEM, but then, it's less. I've had good luck with Pearstone batteries in the past. Rated 4 out of 5 by jbratteson from Great Backup battery Doesn't have the capacity of the OEM battery but for the price it's a great back up. Will this charge in the Canon battery charger included with the Canon Power Shot S110? Thanks. 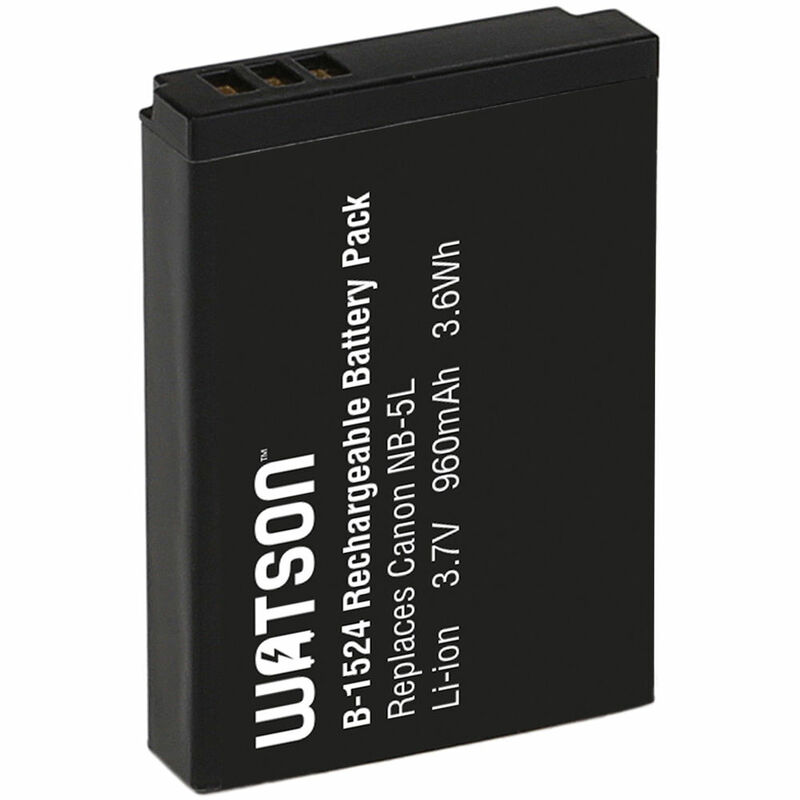 Yes, Watson batteries will charge in the original manufacturer's charger.